Photos by: Geoff Smith unless otherwise noted. * Click images for larger versions. 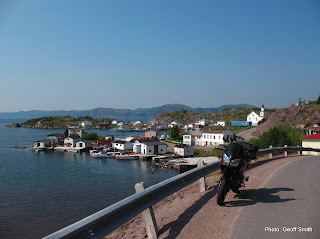 For those visiting the fair island of Newfoundland by motorcycle, be sure to include as much 'coastal road' riding as you can. You won't have to look far because the Island of Newfoundland boasts approximately 10,000 km's of coastline, with another 6,000 km's along the shores of Labrador. Even in a country as big as Canada, those are some impressive numbers! 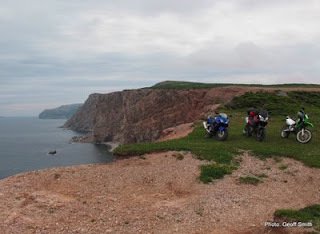 On the coast is where you'll find many of the truly spectacular riding routes. And spectacular they are! It's not uncommon to see moose, icebergs, rocky cliffs, crashing ocean waves, light houses, and plenty of friendly Islanders. 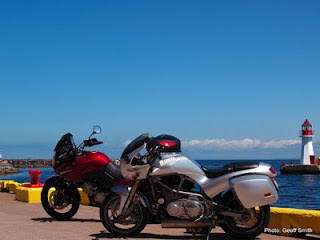 The main highway (Trans Canada Highway [TCH] or Route 1) runs almost entirely inland, and can be somewhat dull, when compared to the wonderful vistas and serpentine roads you'll find along the coastal routes. 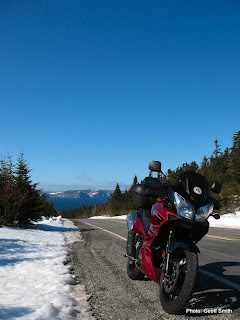 The TCH is a great way to link the coastal routes though. Western Newfoundland - This region of Newfoundland runs from Port aux Basques to the top of the Great Northern Peninsula. With a 1.25-billion-year-old geological history as old as the planet and a human history going back 4,500 years there's plenty to see and do; both on and off the motorcycle. Deer Lake has a rich heritage and a history dating back to 1864 when the first settlers arrived. According to the town's website; Deer Lake derived its name from the many Caribou that could be seen crossing the large lake in the area. The Caribou were mistaken for Deer. 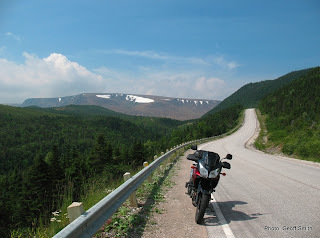 Trout River is within one of the Island's treasure's - Gros Morne National Park. The park is a UNESCO World Heritage Site and haven to geologists and nature lovers. Gros Morne is world renouned, and provides rare insight into the geological evolution of ancient mountain belts. Don't worry though - you certainly don't have to be a geologist to appreciate the stunning sights in this area. Roughly triangular in shape, the peninsula extends into the Gulf of St. Lawrence and is joined to Newfoundland by an isthmus (a narrow strip of land that connects two larger pieces) connecting at the town of Port au Port. Offering up a rocky shoreline measuring approximately 130 km in length you'll not be too far from the ocean at any point along this route. This road offers up some fantastic ocean views. Be sure to stop occasionally to take in a few sights because the road will require your attention. Stop and smell the roses, or should I say, stop and smell the ocean breezes! The railway played a big part in the history of Bishop Falls. A trestle in this small Canadian town is the longest of its kind, east of Quebec, at a length of 927 feet. The town runs along the banks of the Exploits River and is said to offer some of the best salmon fishing on the Island. Maybe you can spare a bit of space in the panniers for a fly fishing rod? The route takes you from Bishop Falls and on to Harbour Breton. 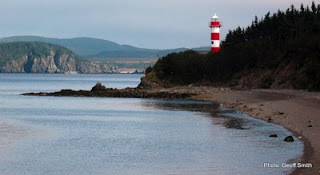 Harbour Breton was founded by early European settlers who relied on the bountiful fish resources in the many bays and inlets that dot the rugged coastline. The traditional fishery is still the mainstay of the town's economy though some are moving into emerging fisheries, aquaculture, and eco-tourism as well. Goobies is a small community that provides a great spot to gas up and have a scoff as the locals might say - you'll likely just call it plenty of delicious food! Another claim to fame is that they've also got a giant moose named Morris, built as a tourist attraction and reminder to motorists to be mindful of these large animals on the roads. Morris weighs in at about 10 tonnes which is quite a bit larger than the local variety. Moose are the second largest land animal in North America and full grown males can weigh 850–1580 lbs. Be particularly vigilant for these mighty plant eating beasts if you must ride ride at dusk or dawn. With their dark fur they're near invisible at night so best to avoid riding after dark if you can. They also have tall slender legs and carry their weight high. Collisions with moose are often deadly for motorcyclists and cars alike. Fortune is a town whose name is thought to come from the Portuguese word "fortuna" meaning "harbour of good fortune." It's also the Newfoundland terminus for the St. Pierre et Miquelon Ferry Service. For this reason Fortune is sometimes referred to as "the gateway to the French Islands." St Pierre et Miquelon is an archipelago of eight islands and the only remnant of the former colonial empire of New France that remains under French control. A very interesting side trip if you've got the time. Port Blandford is a town in eastern Newfoundland which was probably first settled in the late 1870's when lumbering and boat building were the main way folks earned a living here. The first substantial settlement in the area came when the railroad built a line through the town in the 1890's. Way back in the 1500's a freelance Venetian exlporer by the name of Giovanni Caboto (John Cabot), was contracted by England’s Henry VII to find new lands, and a sea route to the Orient. Cabot set sail from Bristol, England in his ship the Matthew in 1497. When Cabot first saw land he’s reputed to have said "O Buon Vista" (“Oh, Happy Sight!”). And that's how Bonavista came by it's name apparently. Last but not least, we come to Clarenville. The town of Clarenville is located near the center of three peninsulas: Avalon, Burin, and Bonavista. The date of the first settlement of this town isn't fully known but can be traced back to approximately 1848 when it was home to a sawmill. Route 1 (the Trans-Canada Highway) and Route 230 pass through the town and link Clarenville to the Bonavista Bay area and to the rest of the provincial road network. Because of this geographic location and the variety of services provided by the area, Clarenville has long been known as "The Hub of The East Coast". The Southwest Arm is likely one of the most photographed areas of the Island. This is the stuff of postcards! Better have your camera at the ready. Two of the main communities in the area are Southport and Little Hearts Ease. That's right! Little Hearts Ease. I challenge you to try and not enjoy yourself riding a motorcycle in a place called Little Hearts Ease! Early settlers were attracted to Southport because of its proximity to the once plentiful fishing grounds around West Random Head and the entrance to the Southwest Arm. It has a long history, having been used as an alternative anchorage by seventeeth century English ships and eventually being settled in the late 1700's. Nowadays though the popoulation is very small, ie: less than 50 inhabitants as of 2007, because of the lack of industry. Most have had to move elsewhere to make a living. One thing Southport still does have in abundance is beautiful scenery. Close your eyes, breathe in the fresh salty air, and it's not hard to imagine what it may have been like living here hundreds of years ago, trying to make a living from the sea. Surely not a spot to miss if you're planning to be near this part of the Island. Cape Spear is located on the Avalon Peninsula near St. John's, Newfoundland. 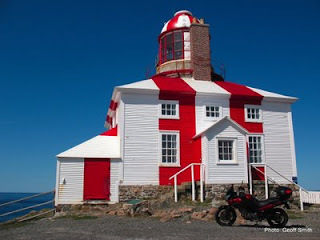 The Cape Spear highway takes you to the Cape Spear National Historic Site, which is the most easterly point in North America* and has Newfoundland's oldest still existing lighthouse. Dating from 1836 it was in operation until 1955 and is now a museum. *There's actually a bit of debate about this, with Nordost Rundingen, Greenland or Semisopochnoi Island, Alaska also laying claim to the title. Most people won't question you on it if you quote it as being such I imagine. History and WWII buffs may be interested to check out the massive guns that remain on site, each weighing 30 tons and had a range of 13 km. The guns are remnants from the Second World War when the site was a coastal defence battery. In 1955 a new concrete building was constructed to house the lighthouse. The original lighthouse building and lightkeeper's house have been restored though.